Now for the river trip segment of our travels. Dave White and I had been camped at Bill Sedivy’s home for almost two weeks. 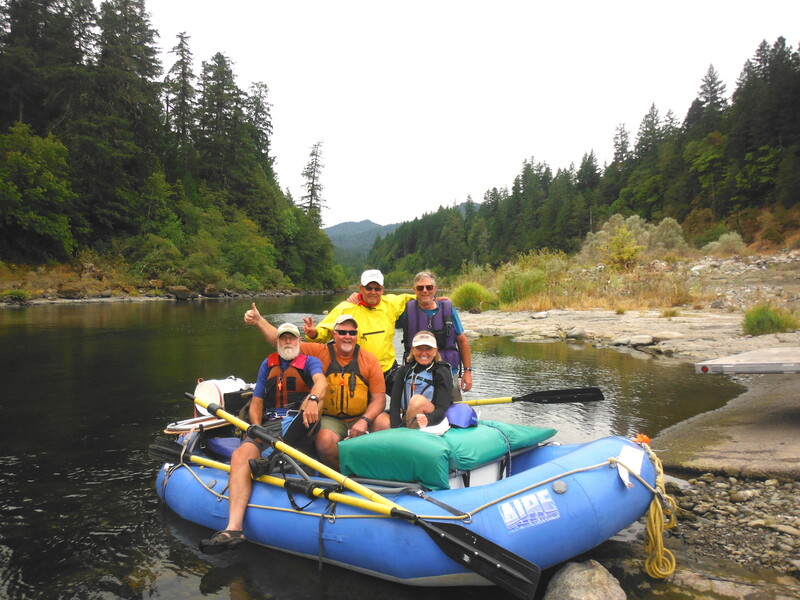 A self-supported river trip entails a lot of time prepping and packing, so we were able to do it at a leisurely pace. Mike Keas arrived from Ohio the day prior to leaving. Our fifth crew member was Bruce Johnstone, a Boise friend of Bill’s. After a morning of packing, all our gear fit in the back of a truck and in two rafts and a cataraft on the trailer. We all piled into Bruce’s extended cab and left town by 11 am on September 7. 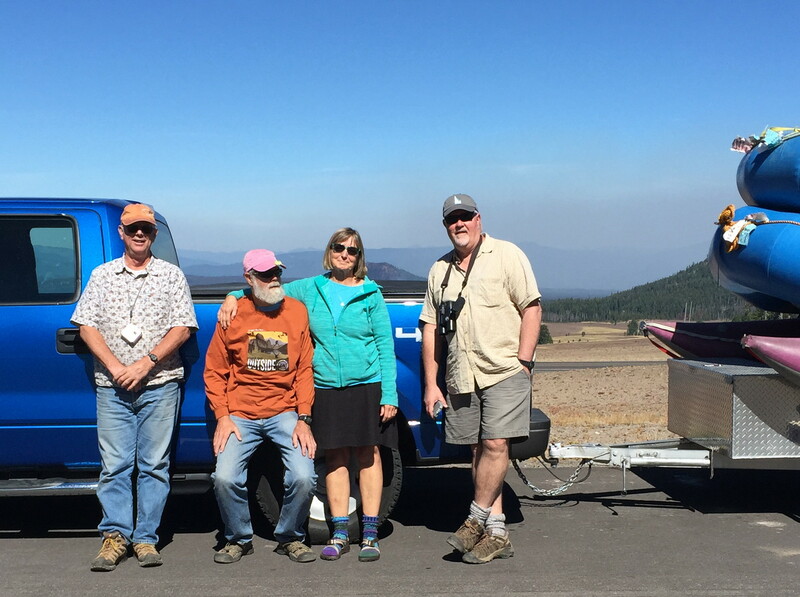 Then we packed in a lot of Oregon touring on our our two-day drive to the Rogue River. 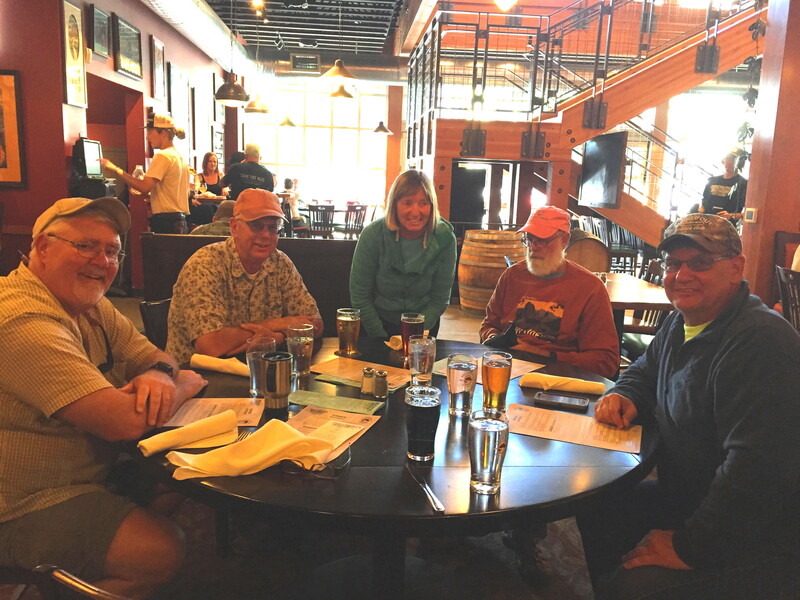 Our first dinner was at the Deschutes Brewery Pub in Bend, Oregon. We found a great Forest Service campground on Little Lava Lake. At 6000 feet elevation, it was a chilly night. 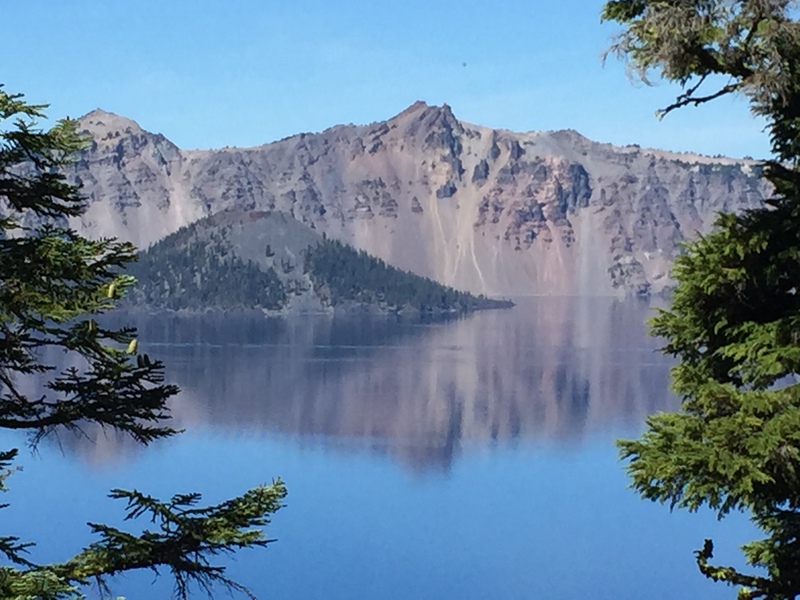 The second day’s route took us to Crater Lake National Park. 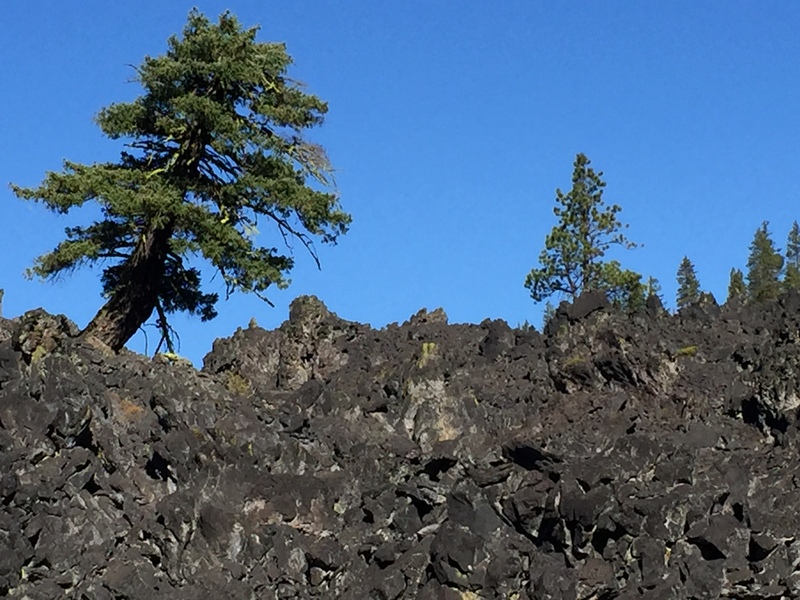 On the way, we drove through lava fields, not what I expected. Bruce, aka Sleepy after a West Virginia shuttle driver, graciously drove us on a tour of most of the park. We popped out at viewpoints like good tourists. 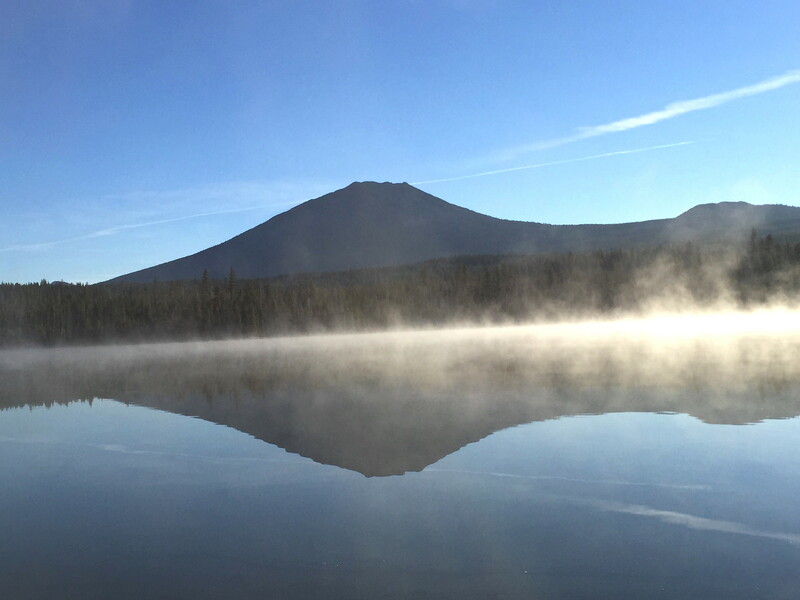 The lake was formed 7,700 years ago by the eruption of Mount Mazama, when the top 5,000 feet of the volcano collapsed. 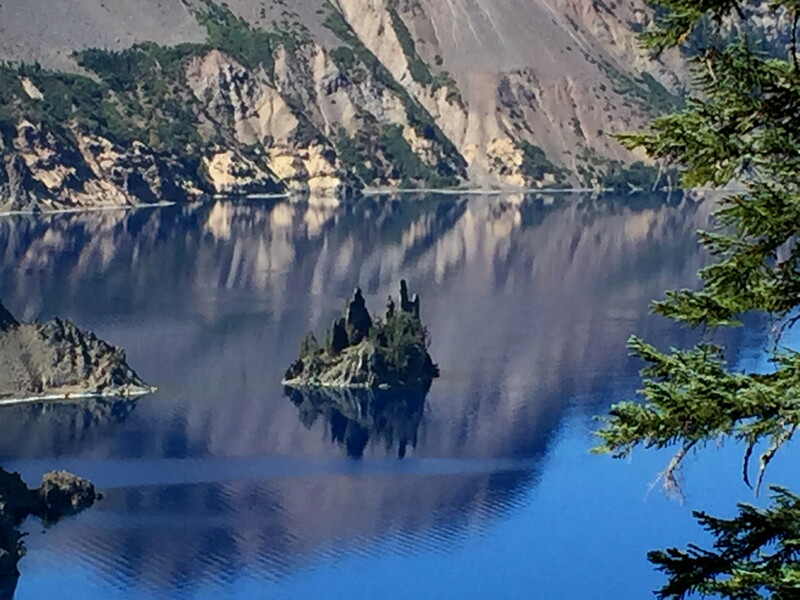 It is the basis of many Native American legends and is the seventh deepest lake in the world at 1,943 feet. I was happy to score another stamp in my National Park passbook! We also stopped at the headwaters of the Rogue. And for ice cream in Grant’s Pass. We launched our six day trip from Alameda Park on September 9. Most boaters do this in three days, but in true Burned Out (canoe club) style, we took the leisurely option. Short days on the river with plenty of time in camps. Hot sunny days in the 90’s and comfortable nights. Water temperature warm enough to dip and float. We even got in two rounds of Burned Out Horse Shoes. The winner: CEO of Sedivy Expeditions, Bill Sedivy. The river was new to everyone, which upped the adventure ante. Camps were plentiful and so were bears. Fortunately we didn’t encounter any, but were extra vigilant about clean-up and keeping our Luci solar lanterns lit all night to deter bears on the rafts and in camp. Some camps came with electrified fence bear proof enclosures for food boxes and coolers. We joked about pitching our tents in them instead. Other than herons, osprey, ravens and some other birds plus one one otter and a few squirrels, we saw no wildlife. 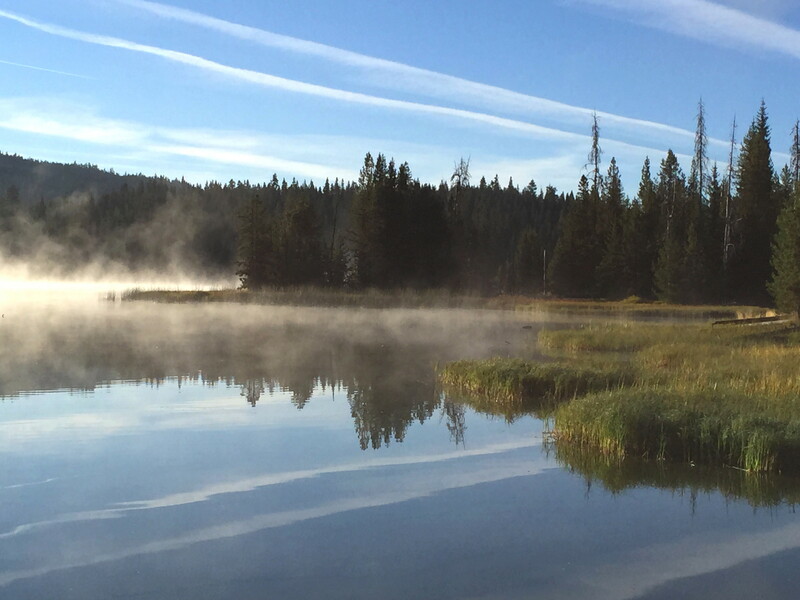 The Rogue flows through the Klamath Mountains, where gold was discovered in the 1850’s. It is a popular place to paddle because of easy road access points. The mountains meet the river’s edge, creating canyons and really cool diverse rock formations. The river is mostly Class 2 and 3 white water, with pools, riffles and gravel bars. 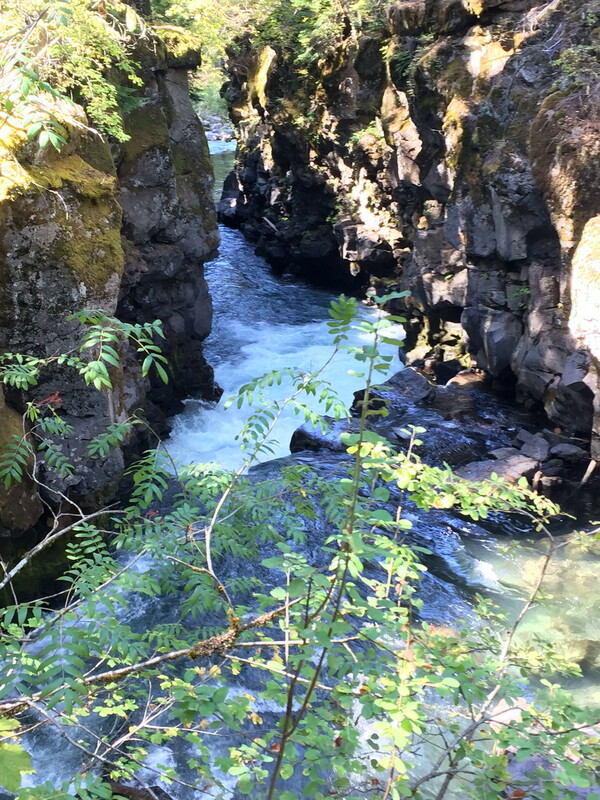 Two rapids are the exception: Rainey Falls and Blossom Bar are both Class 4. After another great river trip, we were happy paddlers on September 14, our take-out day. Total trip mileage was 38, with a take-out at Foster Bar, 40 miles from the Pacific Ocean. 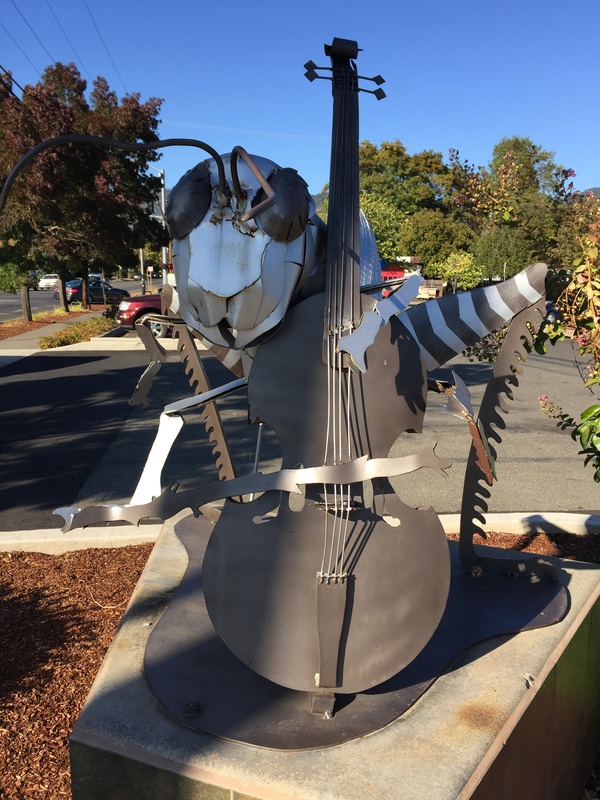 We camped at Gold Beach, Oregon and celebrated with a seafood dinner in town. The next day we drove up the coast and east to Eugene to make the trip back to Boise. Stops included the beach, Oregon Sand Dunes, Coos Bay (to see Steve Prefontaine memorial) and MacKenzie Pass. This entry was posted in Uncategorized on September 22, 2015 by joandr.